ESTELLE orrelle and AVI GOPHER • Institute of Archaeology, University of Tel Aviv, Ramat Aviv, Israel 69978.
iors. The change from a hunter-gatherer socioeconomic system to that of the early agriculturalists involved more than a change in the method of food procurement; indeed, it involved a transformation that touched not only the mechanics of food procurement but the very fabric of stability and values upon which hunter-gatherer society was based. 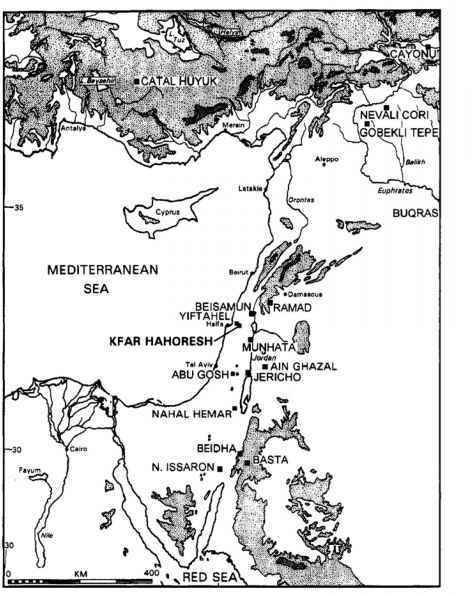 The Pottery Neolithic (PN) period of the southern Levant (ca. 7,5006,000 bp uncalibrated C-14 dates) sees the end of this transformation - and consists of largely two cultural configurations: the Yarmukian and the following Lodian (JerichoIX) entity, and the Wadi Raba cultures (Gopher and Gophna 1993). They represent, on the one hand, the end of a process, the move to food production, and the end of hunting as seen in the dwindling quantities of wild bones and arrowheads in the faunal and lithic assemblages, and represent on another level the new transformed socioeconomy of animal and crop elevation and its accompanying symbolic system. During this period, the domesticated cow, the large manufactured horned animal, appears in the archaeological record at the same time that the last collected resource (hunted gazelle or deer) disappeared.We describe briefly the main characteristics of the two Pottery Neolithic cultures, some of their symbolic aspects, and then raise questions about the social implications of these data sets.